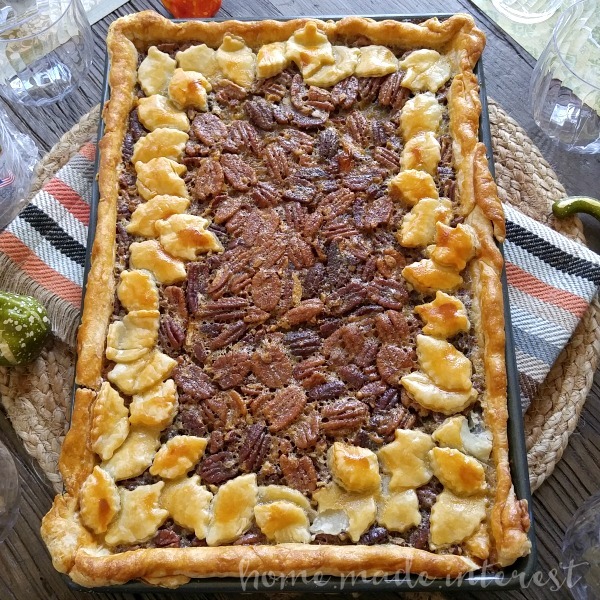 Banana Fluffernutter Pie - Home. Made. Interest. 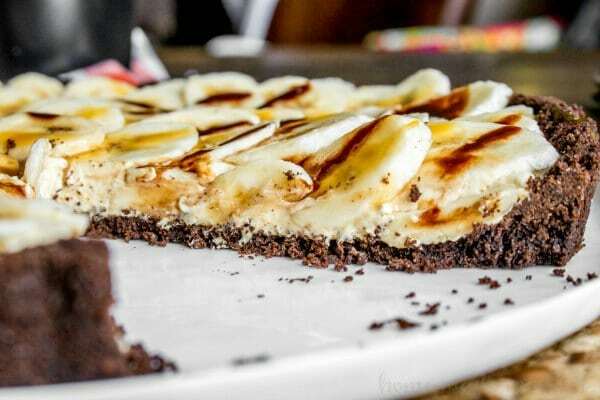 Banana Fluffernutter Pie is an almost no bake dessert recipe baked in a chocolate graham cracker crust and filled with luscious marshmallow and peanut butter cream topped with fresh bananas. 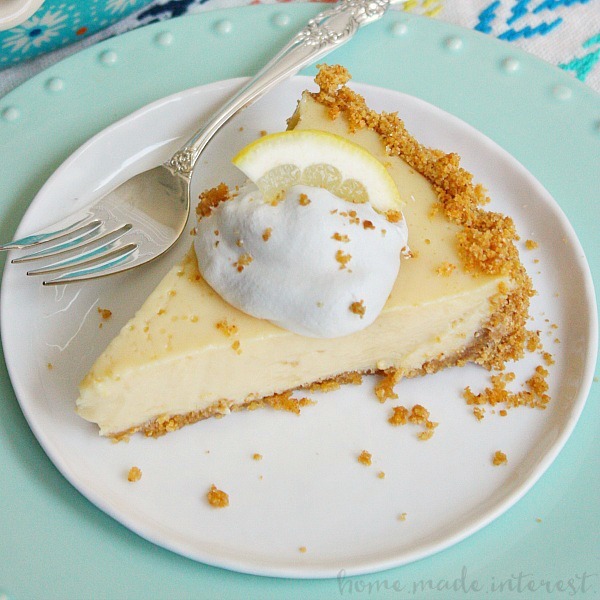 This is a banana pie recipe you don’t want to miss! I love the holidays! The decorations, the time spent with family, and of course, the FOOD! There are so many amazing Thanksgiving recipes and Christmas recipes every where I look. Lucky for my I have at least 3 Christmas parties as well as dinner with the family so I have lots of excuses to try out new holiday dessert recipes. I have my old stand-bys, the BEST Coconut Cake recipe courtesy of my grandma, and Cranberry Fluff, also from her recipe box (grandma made some awesome desserts! 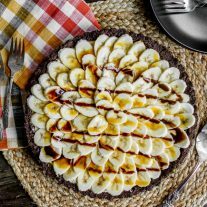 ), but I’ve also started adding some of my own easy dessert recipes to the mix including this amazing Banana Fluffernutter Pie! The pictures don’t do this almost no bake dessert justice. It’s made with three of my favorite dessert ingredients, chocolate, peanut butter, and bananas. Oh! make that 4 of my favorites because it also has marshmallow cream in it and I love that stuff! My guy always requests a banana cream pie for …well anytime I ask him what he wants for dessert, and I love making them for him but I always want to try new things and that’s how I ended up with a Banana Fluffernutter Pie filled with a luscious fluffernutter, made from peanut butter and marshmallow cream, inside of a crisp chocolate graham cracker crust, topped with a beautiful spiral of fresh sliced bananas. I know that presentation can look a little intimidating but I promise you the whole thing is super simple to make. The crust is a simple mix of crushed chocolate graham crackers and melted butter that is patted firmly into an 11-inch tart pan and baked for 10 minutes. The filling is peanut butter and marshmallow cream beaten together with whipped topping and a little gelatin folded in. The gelatin helps the filling hold it’s shape. You fill the cooled crust and put it in refrigerator for at least an hour or overnight if you want to make your Banana Fluffernutter Pie ahead of time. The thing with bananas is they change colors once they hit the air so you have two options to keep your bananas from turning brown. You can slice the bananas and dip them in a lemon water solution (make sure to pat them dry before putting them on your pie! ), or slice the bananas just before you are ready to serve. That’s what I do. It only take a few minutes to slice them up and place them on the Banana Fluffernutter pie and once it’s on the table it disappears fast! This 11" fluffernutter pie is a mix of peanut butter and marshmallow fluff topped with fresh bananas, and chocolate and caramel drizzle. Looking for more amazing pies? Try these! Wow! that looks so delicious! Wow! I love, love your graham cracker house!! You guys did such a great job with it! I think I’m going to attempt one with my daughter and nephew this year. Thank you! I usually go a little smaller so each kid can have their own but this year we went big! oh my that looks yummy!! pinning & printing out to make!! thanks for sharing. Looks Yummy!! Thanks for sharing!! peanut Butter and Banana’s one of my favorites! 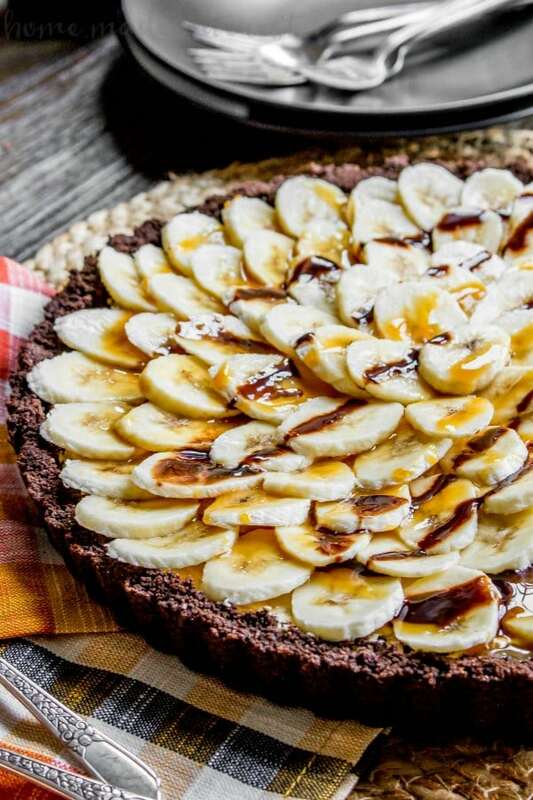 That Banana Fluffernutter Pie looks amazing. Love the pics! I found this over at The Inspiration Board link party. This pie sounds decadent and delicious. I think this would be a popular pie at my house for holidays! The houses are so cute! Thanks Farin, I hope you enjoy it as much as we did! OMG I love this!!! I would have to make it around the holidays because I don’t know if I could trust myself alone with it! lol! LOL, I know what you mean. I’m making it again for Thanksgiving, that way I can leave the leftovers with my parents ;). Oh my goodness, this looks so yummy! Thank you for sharing this awesome recipe with us! Oh, that pies looks absolutely divine. I could dig in right now! Oh, that pie looks absolutely divine. I could dig in right now! Yum that pie looks so good! I love baking with nephews, it’s always so much fun! That house is so cute too! Hanging out with the nieces and nephews is the best. Your pie loots so yummy. I love peanut butter and bananas. Mmm. Heading there after work today. I can’t wait to see those little stinkers! Those treats both look amazing! Thanks for sharing them at the Say G’day Linky Party. I’ve just pinned them to the Say G’Day Saturday board. Now that is a yummy looking pie! Oh wow that pie looks incredibly good! The pie looks scrumptious. And the little graham cracker house is great. Looks like fun. Hey chickie! 🙂 You will be featured this week at Teach Me Tuesday as my fav 😉 Thanks so much for linking up every week and for all the awesome stuff you make!! Your pie looks AMAZING!!! Seriously. I love the bananas the drizzle. I just need a work and this pie. YUM! Thank you for linking up with #FoodieFridays.